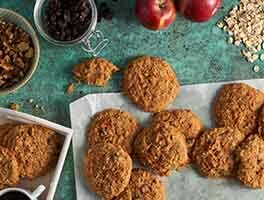 These crunchy cookies are a jumping off place for your favorite chips, fruits, and nuts. Use all chocolate chips; a combination of flavored chips (white, chocolate, and butterscotch are tasty); or throw in some nuts, or dried fruit. Make them with all-purpose flour; or substitute white whole wheat flour for a fiber-rich treat that no one will ever guess is 100% whole grain. 14 mins. to 15 mins. Preheat the oven to 375°F. Lightly grease (or line with parchment) two or more baking sheets. Beat together the butter and sugars, then beat in the eggs and vanilla. Grind the oats in a blender or food processor until they've turned to a coarse powder; add to the sugar mixture along with the flour, baking powder, baking soda, salt, chips, and fruit or nuts. Beat gently until well combined. Drop the dough by tablespoonfuls onto the prepared baking sheets; a tablespoon cookie scoop works well here. Leave about 1 1/2" between each ball of dough; the cookies will spread. Bake the cookies for 14 to 15 minutes, or until they're very lightly browned. Remove them from the oven, and cool right on the pans. If you need the pans for the next batch, transfer the cookies to a rack to cool. Yield: about 5 dozen large (2 1/2" to 3") cookies. Really good cookies. Just used the old fashioned rolled oats without blending them which gave a nice texture (I think). Blended semi sweet dark chocolate and white chocolate chips (Ghirardelli) and went w pecans. Skipped the dried fruit because didn't think my kids would like them. Served up a few for my wife and I w glasses of milk after the kids went to bed to reward us for another day w 4 kids! 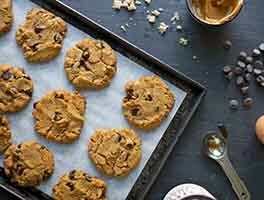 This is an awesome "crunchy" chocolate chip cookie recipe! 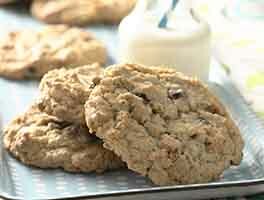 I love that such a delicious cookie can be made with white whole wheat and oatmeal! Followed the directions perfectly, no substitutions or modifications, weighed my flour, and added the extra bit of water (per the KAF staff recommendation when using WWW flour). Absolutely awesome cookie. And they spread beautifully! Thank s KAF for such an awesome reliable recipe. I'm adopting this as my base cookie dough for sure! I just made these for my coffee shop. They turned out perfect. They have the eye appeal that I need, taste great and are easy to make. Oh my Gosh - these cookies are light and crispy - not thin, they have mass, but are as light as a feather. I wish I could describe the texture better. I just enjoy these very very much, they're delicious and I can't get over the texture. I think they're the best cookies to have come out of my oven. A delicious and hearty cookie! 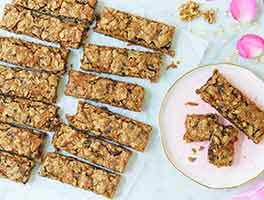 Maybe not exactly "healthy", with a cup of butter and 2 cups of sugar, but stick-to-you and chock full of goodness nonetheless. Followed the recipe exactly, word for word, weighing out everything, using all the sugars, and all the add-in's called for (lower end of the nuts window) so I would have a good gauge of what they are supposed to be. They make a loaded cookie for sure, yum! Not too sweet at all IMO, and I think when people KNOW how much sugar they are using they THINK it's too much. I used a combo of 60% chocolate chips, white chocolate chips, and walnuts, with the white whole wheat flour. Love the 100% whole grain value here! I made the dough in the morning and had to run our for a couple hours so stuck it in the fridge, which made the already very stiff dough very, very stiff. I used a #40 cookie scoop, and packed the dough in to level which made big rounds, and came out with 4 1/2 dozen. Okay fine, 4 dozen plus 5 but I may have nibbled a cookies worth of dough. They did not spread much at all, and so did NOT look like your picture, which is my only complaint (not enough to deduct a star though). After the 1st batch I flattened the balls a bit before baking which helped but still not enough to make them spread as flat as I like. I thought maybe it was a result of refrigeration, but by my 2nd and 3rd batches the dough had come to room temp and was still very stiff and the results were the same. So these are a thick cookie. My 2 boys and husband loved them, and they'll make a high value snack for the cooler for a ski race this weekend- if they make it that long which is doubtful! I'm wondering- when baking bread you usually recommend adding a tbsp or so of liquid to a recipe when swapping in whole wheat for white, so wouldn't that apply here? Amazingly the WWW and oats absorbed all that butter and egg and made for a drier cookie, and I'm imagining if I used all purpose it would be less so. Rather then adding liquid, maybe use slightly less flour if choosing the WWW option, and if so by how much? 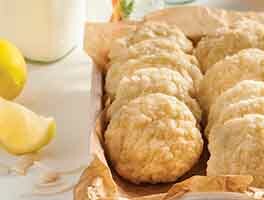 Love the nutritional quality of this recipe which includes oatmeal and whole wheat flour. That said, I reduced the sugars to 3/4 Cup each but would not do this again, the batter was very dry and the cooked cookies did not spread out as I would have liked. I also divided the dough to make two different cookies, one batch included semi-sweet chocolate chips with macadamia nuts and the other batch included white chocolate chips with cherries and slivered almonds. This recipe is WONDERFUL!! I used semi sweet chips & raisins...perfect combination. These will definitely be in my cookie baking rotation! 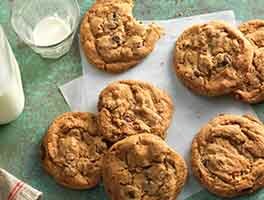 I instantly recognized this recipe as very close to my all time favorites -the famed "250 dollar chocolate chip cookie" recipe. However I love the adaptability of this version and the fact that the ingredients are given in weight as well as volume which is so much faster, less messy etc. I used the APF rather than the wheat flour. and I used 12 ounces of Ghirardelli semi-sweet chocolate chips, 4 ounces of KA Guittard semi-sweet mini chips plus 4 ounces of macadamia nuts. The original 250 dollar cookie recipe calls for a shredded 4 ounce chocolate bar. The mini chips work just as well and are less messy. The cookies were beyond delicious, but I did find that they cooked much faster than the recipe said. I used my convection toaster oven on the "cookie setting" and that might have been why they cooked so much faster. It is Summer and I didn't want to heat up the whole kitchen and other than baking quickly the toaster oven did a good job. I weighed each scoop to 1.25 ounces and rolled them into balls and refrigerated before baking and I have been baking as I go. I used pasteurized shell eggs so I don't worry about storing the dough for a few days. I also like refrigerating the dough because I don't like for my cookies to spread and these stayed round and thick. The texture is just perfection but I like a little give to my cookies. I love these cookies and so did my husband. He thought the addition of oats would make it easier for him to resist them but that didn't work out at all. They are absolutely delicious. I wanted to add I like them better with walnuts (especially with semi-sweet chocolate) but all I had was the macadamia. Oh my just made these. I didn't blend the oats and used half quick oats and half quick steel cut oats.....yum!